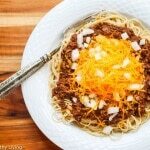 Slow Cooker Cincinnati Chili is packed with flavor, with a touch of cinnamon and spice. Serve topped with chopped onion and finely shredded cheddar cheese in the traditional style. 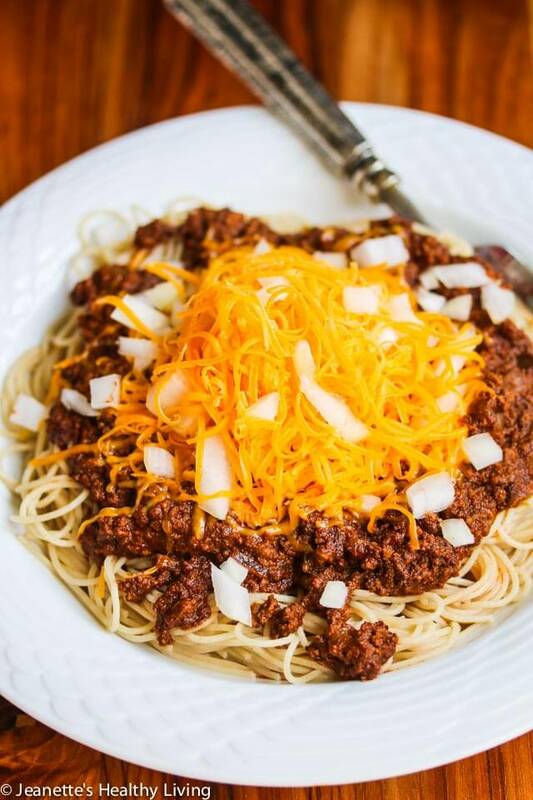 I first made Cincinnati chili about four years ago after hearing several people from Cincinnati rave about it. A friend gave me a can of Cincinnati chili so I could try it, and I used that as a sample to come up with a version that was pretty close to it, but with a lot less salt. It took a number of tries before I got the recipe very close to true Cincinnati chili. 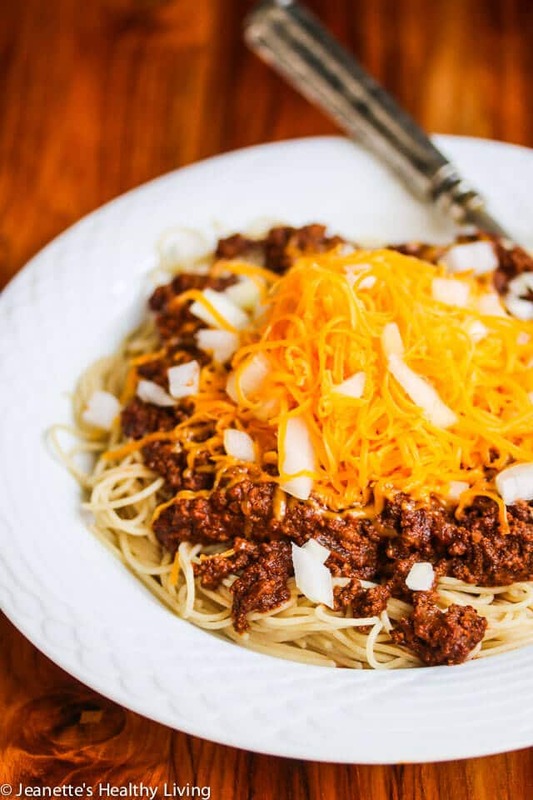 There are a lot of different spices and ingredients that work together to create the unique flavor profile for Cincinnati chili. 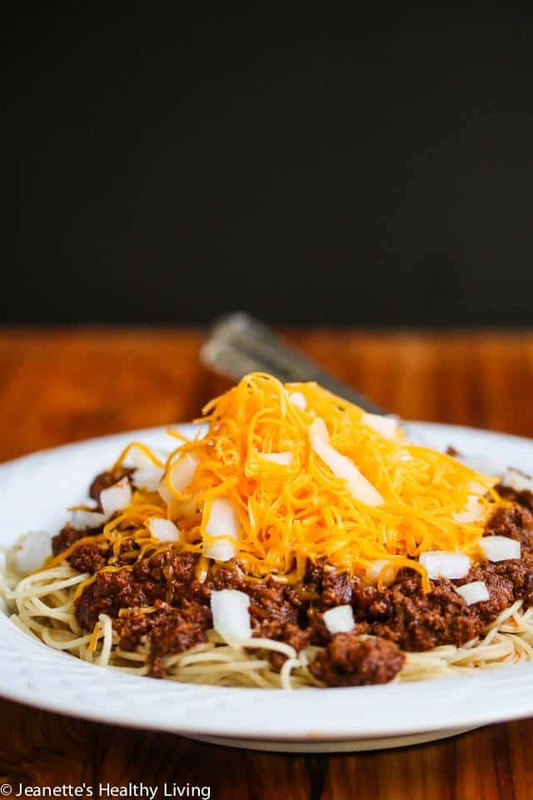 Although I could figure out the basic ingredients, it wasn’t until a Cincinnati chili enthusiast friend who is also an incredible food scientist told me the secret ingredients. 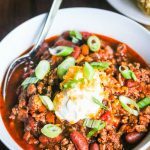 He said there was probably a touch of cloves and vanilla in the chili, so I revised my original recipe and came up with this more flavorful Slow Cooker Cincinnati Chili. 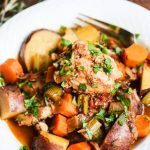 This has become one of my family’s favorite recipes and my youngest son has requested it for his birthday dinner several times. Our family tradition has been that the birthday boy gets to choose whatever he wants for dinner. I remember making this Cincinnati chili with all the fixings for his 13th birthday several years ago. 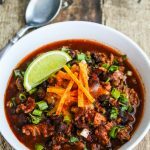 This chili freezes well, so don’t be afraid to make the whole recipe. I use 3/4 teaspoon cayenne pepper, but if you want a milder chili, reduce it to 1/2 teaspoon. Place ground beef and water in a large pot, breaking up pieces. Bring to a boil, then reduce heat to medium-low and simmer 20 minutes. Drain meat and place in food processor; pulse until meat is a fine consistency (do not overprocess). 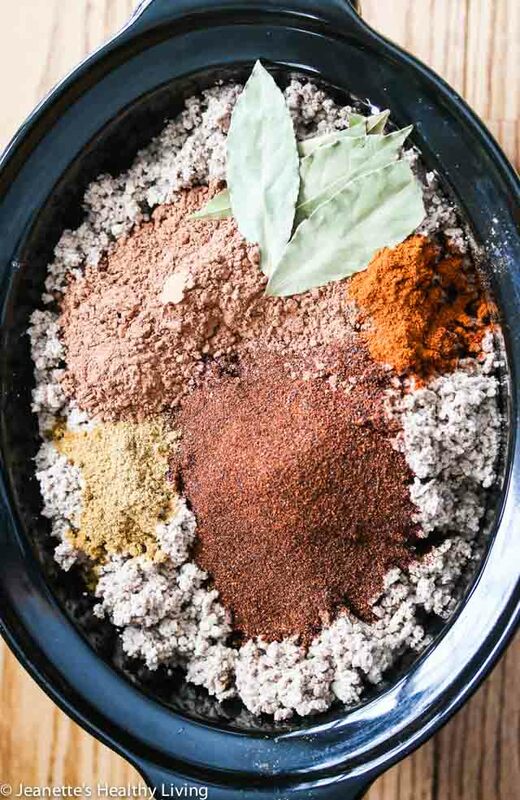 Transfer to a slow cooker; add remaining ingredients. Cook on low for 8 hours. Spoon chili on top of cooked spaghetti and top with some shredded cheese, onion and kidney beans. 5 Freestyle points/serving. 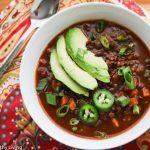 Nutrition facts are for chili only. I don’t make chilli very often but this is really tempting me. 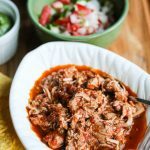 This is different from traditional chili – lots of sweet spices in it. 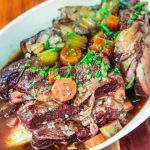 Great recipe Jeanette and I love the addition of vanilla and cloves! Your son clearly has fabulous taste 🙂 Happy back-to-school! Thanks EA! My son does have a great sense for flavors. Hope you had a great summer! 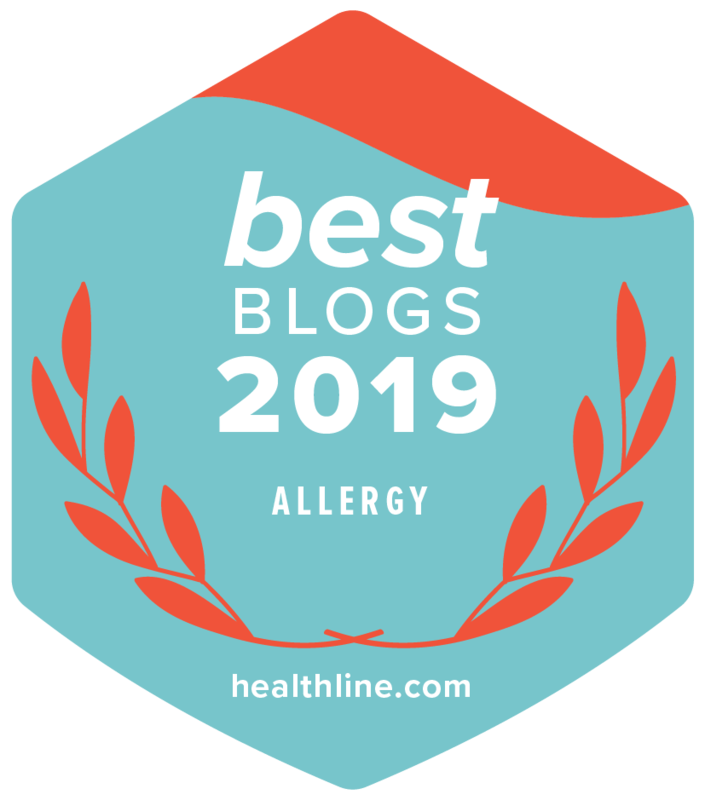 I love Cincinnati chili and the chocolate square is such an intriguing idea, I bet that adds some serious depth. Great recipe Jeanette! Thanks Katy – this chili has lots of great flavor – hope you have a chance to try it. 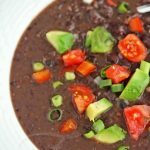 This looks so much better than a traditional chili….so delicious! Any suggestions on an alternate way to cook it, as I don’t have a slow cooker? Thanks in advance. My family is from the North, but we all relocated down South. We’ve been trying to replicate Cincinnati Chili for years since you cannot find it anywhere, and this is the closest I’ve ever tasted. I tweaked a bit, (instead of pulsing the beef, I just broke it up so well with my hands, that it becomes the right consistency in the water while still raw), but the spices are spot on!! I will be making this regularly! 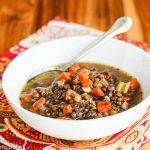 Sarah – so glad you liked this recipe. Thanks so much for trying it and letting me know how it turned out. Do you add the 4 cups of water to the crackpot after boiling the meat? Or is that what you boiled it in? Hi Amanda, after boiling the meat, drain off the water. Then, when you put everything in the slow cooker, add 4 cups of water. What’s the point of boiling the meat? I think it helps break the meat down. However, I found pulsing it in the food processor helped get it to the right consistency. 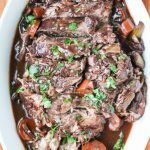 You do not want to brown the meat, just cook it. 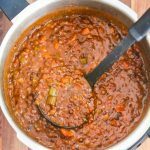 So glad your family enjoyed this recipe – it’s one of my kids’ favorites so I try to make a big batch and freeze it. Maybe double it next time so you can freeze a batch. Great for busy nights. Wanting to try this but only chocolate I have in the house is dark chocolate chips. Could I use some of those? Hi Tom, I would not use dark chocolate chips as they usually have sugar in them. If you have unsweetened cocoa powder, you can substitute that for the unsweetened chocolate. One ounce of unsweetened chocolate is sometimes substituted with 3 tablespoons of unsweetened cocoa powder. Thanks so much for the quick reply. I just came back on here to ask about using cocoa and saw your reply. Gonna be making this today. Thanks again. Hope you enjoy this recipe Tom! Had tried this a while back. My daughters and I enjoyed it. Now it is Memorial weekend and we are planning on having some hot dogs on the grill. Girls asked me to make this to use as a hot dog sauce. So, will be trying that this weekend. Glad your daughters enjoy this – it’s one of our family’s favorites. Enjoy Memorial Day weekend!